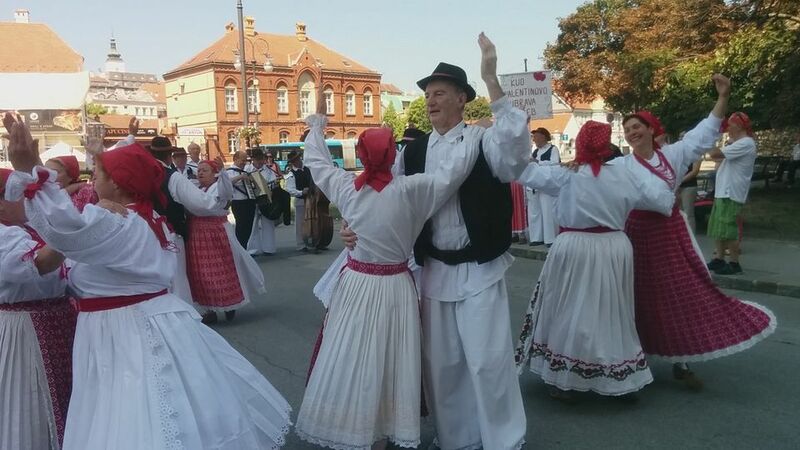 These men's and women's traditional Croatian costumes show blue-and-white lacework, fringed shawls, flowered headdresses, woven sashes, and vests. This style of straight-legged pants can be seen in Croatian men's costumes of various regions. The black vests are also typical. 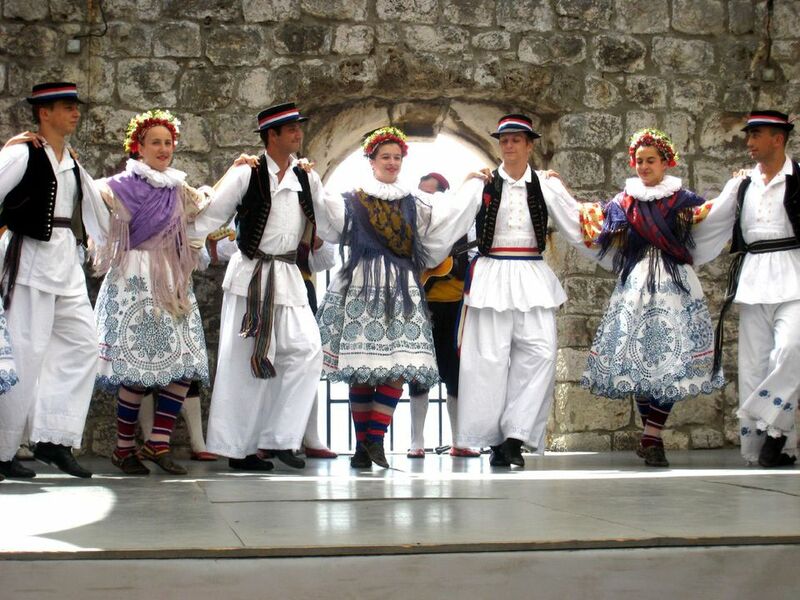 Croatian national costumes vary widely in design, colors used, and accessories worn. Regional preferences must also be taken into consideration, as well as the social status of the wearer. For example, a young unmarried woman might wear traditional clothing of her region with specific elements (brighter colors, a different headdress or hairstyle) to set her apart from the married women. These women wear matching dark jackets over skirts that are made of patterned lace. Their long white headdresses hide their hair. Their necklaces, made of coins, are an element found in other female traditional costumes from Croatia. This costume was on display in Porec. The white dress and shirt are decorated with red embroidered scrollwork, leaves, and flowers. The black-and-white photo to the right of the folk costume shows three women wearing similar outfits. People from Moslavina, a region in Croatia that encompasses Zagreb, traditionally wore white clothing heavily embroidered with geometric designs. Panels of embroidery decorate the sleeves and skirts of these Croatian dancers. The women wear coral necklaces, though other types of neckwear are also typical to this region. All-white clothing (without colorful embroidery) was reserved for senior women or women in mourning. Cilipi is a village near Dubrovnik. These dancers wear the traditional costume of the village. The woman wears a long white skirt and blouse, black vest, embroidered sash, and yellow tassels around her neck. The man wears black, knee-length pants, a matching vest, and a white shirt. Both dancers wear a red hat typical to many Croatian traditional costumes. These ladies come from Osijek, a city in the eastern Slavonian region of Croatia. Red-and-black cropped vests stand out against the clean white lace of their blouses and aprons. A smattering of floral embroidery decorates the sleeves and aprons of some of the women. Their headdresses are folded neatly and cover the backs of their necks.